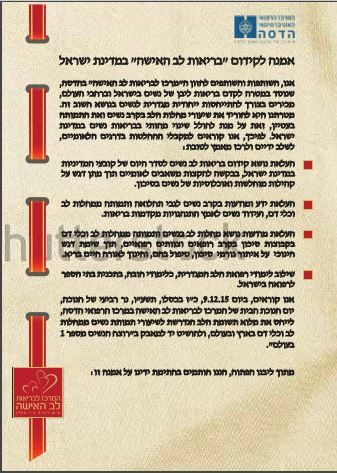 The Linda Joy Pollin Cardiovascular Wellness Center for Women at the Hadassah Medical Center has issued a Declaration that calls on policymakers and stakeholders to work to reduce cardiovascular disease in women. The Declaration, presented at the official dedication of the Center’s new offices, was signed by Knesset members and Ministers who have pledged their support for the mission. The document calls on these policymakers and stakeholders to join hands and unify their efforts toward placing the issue of women’s heart health on the national agenda and to allocate government resources to this issue—particularly for populations at risk. Jerusalem women, particularly those in the ultraorthodox Jewish communities and Arab sectors need to start early to acquire healthy heart habits, explains Dr. Donna Zfat-Zwas, Pollin Center Director. At least one in three Jerusalem Arab women is overweight and has diabetes, according to her colleague, Prof. Gil Leibowitz, head of Hadassah’s Diabetes Unit. The Pollin Center has implemented outreach projects in both the ultraorthodox and Arab communities in Jerusalem to raise awareness about how to live a heart healthy lifestyle. Miriam Dissen, principal of the Bais Yaakov School in Jerusalem, was delighted to welcome the Pollin Center project to her school of 3,000 teens and young women. “The lectures and guidance,” she said, “have had a lasting change on the teachers’ habits. They still walk the stairs and wear their pedometers, and try to eat healthier.” In addition, she notes, they have learned to incorporate health promotion concepts into their classes so that all the girls are benefitting. Mrs. Dissen was among the principals of Jewish and Arab schools who attended the Pollin Center dedication, along with Minister of Health Yakov Litzman; Minister for Social Equality Gila Gamliel; MK Aida Touma-Sliman, head of the Knesset Committee for the Promotion of Women and Gender Equality; and Prof. Naama Constantini, head of the Council for Women’s Health. MK Touma-Sliman, who introduced the Declaration at the dedication event, promised that this Declaration would not be a document that one signs and forgets; rather, she pledged that together with the Pollin Center, there will be follow up. Subsequently, tens of MK’s signed the declaration.